Let's look at the wood texture of a piano in detail. 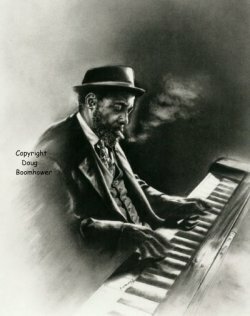 As an example, we'll use this original charcoal drawing of jazz legend, Thelonious Monk. Notice the top of this piano. Careful attention was paid to the grain of the wood, which is all drawn with charcoal pencils. The best pencils for general work are B, 2B, and 3B pencils. The HB is a hard pencil so it is not used that often. However, when you want a hard line like the one where the edge of the wood meets the top of the piano keys, the HB pencil works great. It creates contrast and therefore provides clarity between the wood and the piano keys. As described below, a few of the striations showing the wood grain, are also done with an HB pencil. It makes a very sharp point and the lines stand out creating a more realistic wood texture. Notice the wood grain on the piano. These grains were sharply done with an HB charcoal pencil. Other grains were done with a 3B pencil and then smudged with blending stumps. However, they are not smudged to the point that wood grain disappears. Highlighted areas indicate the natural lighting you often see on a varnished surface. The contrast between the various grains add to the realism. This indicates a metallic lock. Attention was paid to the screws on the metal plate. This clearly defined edge clarifies the construction of the piano and adds a nice contrast to set off the wood grain. Note these knots in the wood. Once again, such details add interest and realism. A large part of the texture was created by lightly rubbing the side of a charcoal pencil over the grain of the paper. 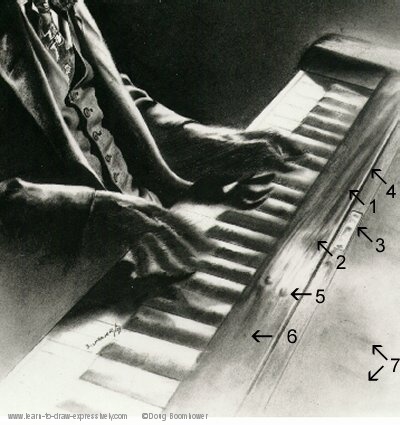 Although these smudges may look quickly done, they were carefully thought out in order to emphasize the look of a shiny, varnished piano. Would you like to see more? Have a look at these violin drawings.